Although we were sorry to bid goodbye to our Spanish adventure, it was wonderful to get back to London. No sooner had we gotten off the plane than we whisked off to a large Lunberg family outing to see Tosca at the English National Opera. It was great to be back with our noisy and passionate family, wildly gesticulating and explosively laughing through our pre-opera pizzas. We hadn’t seen Tosca before, and it was a fabulous production, with bold, dramatic lighting designs that emphasized the violent emotions of the story. And when Tosca fell backwards off the set to her death, there was an audible gasp in the audience. The next day, with barely a moment to unpack, I went to the Haymarket theatre to see a really interesting play called the Two Worlds of Charlie F. The production was an outreach project that the Haymarket did in collaboration with the British Legion. Soldiers from the Bravo 22 Company who were wounded in Afghanistan worked with a director, writer and professional actors to create an incredibly moving piece of theatre. They brought their stories to life with shocking honesty. They showed me the effects of war and created images I will never forget. They performed with humour, integrity and insight. However, I could only stay for the first half of the show. My foot, which had been sore for a number of days, began to swell up and soon I was in tremendous pain. Nothing close to the pain I was seeing on stage, but nevertheless, I had to leave. I hobbled home to Surbiton and headed to the emergency department of the Kingston hospital. The NHS (National Health Service) was terrific and diagnosed it as cellulitis, an infection brought on by my excessive walking in Barcelona. I was proscribing an aggressive round of antibiotics. It was going to be a while before I could put on any shoes. Even though I was taking it a bit easy, nothing was going to stop us from having a great Robbie Burns party later that week. Bryan and Robbie Burns share the same birthday, so it is a tradition here in Surbiton to have a big party to celebrate. Because my birthday was in the same week, we got to share in the festive dinner, which included a huge roast beef, various root vegetables (parsnips, turnips, swedes, carrots, potatoes) and vast amounts of haggis (vegetarian and non). A fabulous meal, and about as far from our Spanish diet of shellfish and squid that you could get! 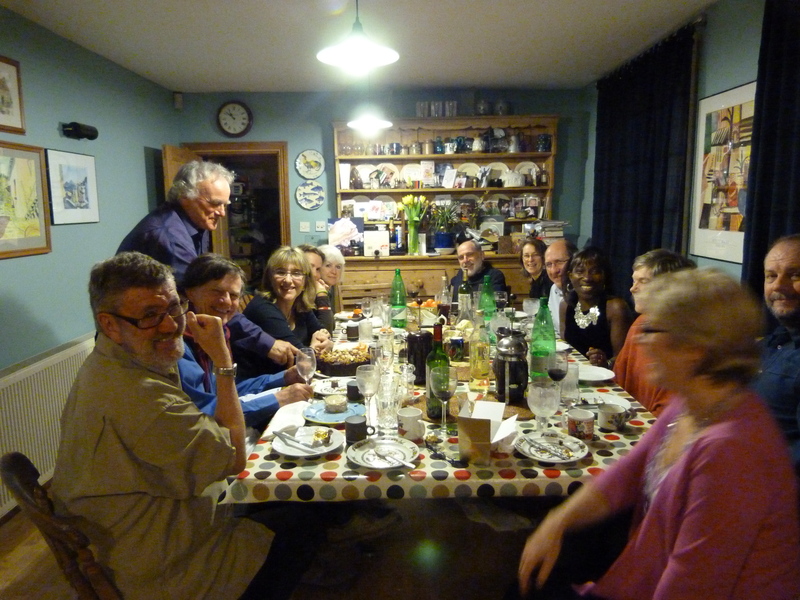 The next night, I was able to hobble out so that we could go for a farewell evening with David and Hinda. We went to the new movie of Coriolanus (incredible—one of the best adaptations of Shakespeare I have ever seen. See it in the theatre if you can, because the sound track is amazing. ), followed by dinner at Pollen Street Social, offering “de-formalized fine dining”. I was still wearing my hiking boots because of my foot, which felt very embarrassing in such a posh environment. Definitely “de-formalized”. But the meal soon made me forget everything else. Starters of Cornish crab vinaigrette with Nashi pear and light cured Sheltland Salmon with avocado; mains of roasted sea bass with truffle sauce and halibut bourguignon; finishing with a cheese plate of 10 different cheeses from throughout the UK and Europe. Each dish was a unique sensation, with incredible attention to detail. Suddenly it was after midnight. We bid a fond farewell to David and Hinda and hurried to catch the last train to Surbiton, racing to Waterloo in a cab, since the Tube was already closed. It was the first time I had realized that the Tube closes so early. Seems crazy! I was still in my unlovely but functional hiking boots a few days later when we went to the opening of the “Works on Paper Art Fair”, an art exhibit and sale. There were 54 different booths from art dealers all across the country. It was like a scene from a movie with dealers, aficionados, speculators and investors walking around with bottles of champagne and talking about the first Hockney/Renoir/Matisse that they bought. I decided to pretend that I was so fabulously rich that I didn’t have to care how I looked, and within minutes was having a long conversation about some exquisite (and expensive) Samuel Palmer lithographs. I took the dealer’s card as regally as I could, and promised to visit the gallery when I was next in Herefordshire. Retreating from that rarified atmosphere, we headed to the Phoenix Artist’s Club to see “La Chunga”, a play by Peruvian-Spanish writer Mario Vargas Llosa. A friend from Ottawa, Jessica Ruano, was the assistant director on the production, and it was great to see her, and her work. The play is a really compelling exploration of machismo culture and sexual politics, stylish and honest in its approach. It was performed in a tiny space at the back of the pub, downstairs from the Phoenix Theatre. A great venue and perfect for the play, which takes place in a bar. We loved it. Sometimes, it drives me crazy to be here with so much going on all of the time. The possibilities are infinite. There is a new adventure around every corner. It is great to be back in London. Yes, I am sure you would LOVE all of the Gaudi structures, constructions, explorations. Thanks so much for the bedside-manner sympathy. I certainly wish you were here to nurse my sore little piggies, although you’d probably tell me to stay off my feet which just isn’t going to happen right now!